The tiger scrolls are awarded by the individual Blade Brothers, master swordsmen who are scattered throughout Hyrule. Once you train with one of the Blade Brothers, you'll be rewarded with a Tiger Scroll detailing what you have learnt. Detailed here are the locations of the Blade Brothers, and how to get all the Tiger Scrolls from them. Swiftblade - You encounter Swiftblade by default as part of the main storyline. He is located in a house to the south west of Hyrule Town. Swiftblade the First - He is a deceased ancestor of Swiftblade, remaining in Hyrule as a ghost! 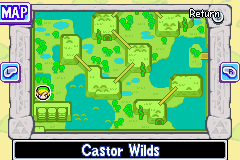 He is located in the Castor Wilds. There is a large tombstone to the west, push it upwards to reveal the entrance to Swiftblade the First's dojo. Grimblade - He is in a hidden location at the Hyrule Castle gardens. Go to the south east of the gardens and you will find a patch of bushes, cut them down to reveal a ladder leading to Grimblade. 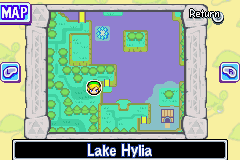 Waveblade - He is in Lake Hylia, to the west of the Mayor's Cabin. Greyblade - Go to Mount Crenel and climb up the four walls that are situated the east. Head inside the cave at the top. In order to get to Greyblade, you'll need to split yourself into at least one other Link so you can press the two switches to enter Greyblade's lair. Splitblade - Fuse kinstones with Grimblade (see above for the location of Grimblade). Once you do so a waterfall will open up in Veil Falls and reveal a secret passage, enter it to find Splitblade. Scarblade - Fuse kinstones with Greyblade (see above for the location of Greyblade). 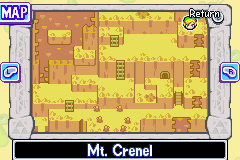 Once you do so a waterfall will open up in Mount Crenel and reveal a secret passage, enter it to find Scarblade. Greatblade - Fuse kinstones with Waveblade (see above for the location of Waveblade). 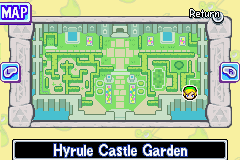 Once you do so a waterfall will open up in North Hyrule Field and reveal a secret passage, enter it to find Greatblade. Description: Hold your sword button. Charge and release! This scroll is obtained by default from Swiftblade. Description: When your hearts are full, swing your sword! You need to light all the torches in the area using the Lantern before Grimblade will let you train. Description: Equip your pegasus boots and sword, then dash away! Once you get the Pegasus Boots, head over to Swiftblade to learn this attack. Description: When you only have one heart left, swing the sword! A bit of a strange attack, since you wouldn't seek to actively use this ability, but it has some occasional uses. Description: Break pots with your sword! That�s all there is to it! At the very least, you'll need to have the White Sword (obtained after you get the first two elements), otherwise Swiftblade will not let you learn this attack. Description: Roll! Swing your sword as you start to get up! There is no requirement to use this attack. You should rarely, if ever, need to use it. Description: Equip the Roc�s Cape and the sword!! Jump and swing! Once you have the Roc's Cape, Swiftblade will teach you this ability. Description: Perform a Spin Attack... and hit the button repeatedly! Once you have all the other seven tiger scrolls that are listed above, Swiftblade will teach you this potent ability. Description: Spin Attack charges faster! Description: Great Spin Attack lasts longer! Description: Spirit Gauge fills faster!